What Are Your Character Creation Bad Habits? I am a creature of habit. I order the same things at restaurants, I drink the same beer. I have television shows that I watch over and over, like comfort food. This becomes a problem in my game of The Sims 4, where all my new sims are using the exact same hair. 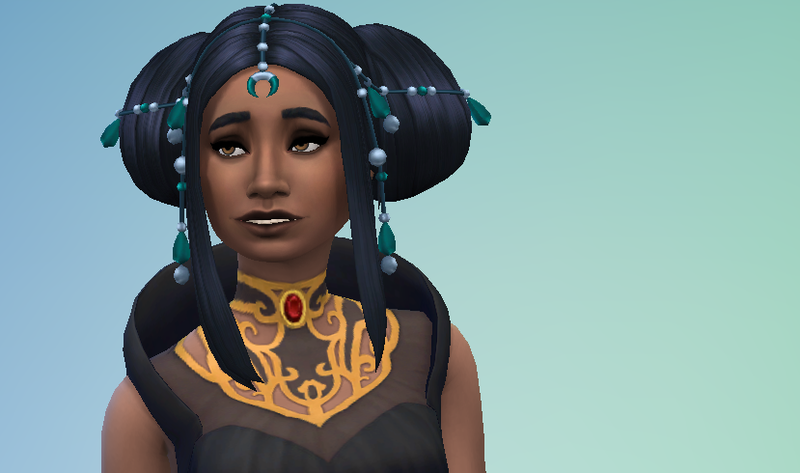 The Sims 4 Vampires came with four new female hairs, and they’re all a little gothy. But my favorite, by far, is this ornamented double bun straight off of Akasha from Queen of the Damned. When I saw it in the trailer I thought I’d never use it, but there’s something so luxurious and tacky about it. The jewels even change color with different hair colors. Of course, this means that there’s four sims in my game who use this hair in at least one outfit. And it keeps showing up on randomly generated “townie” sims. I’m approaching a sims hair singularity, and I don’t know how to stop it. What about you, gentle readers? Are there character creator options that you keep returning to, game after game? Can’t live without your playable character having freckles? Modded in Beyonce’s hat from the Formation video into all your games? Let me know in the comments.